About 5 or 6 years ago, I decided that my classroom needed to be practically paperless. That’s when I became a Google groupie. I drank the lemonade and haven’t been the same since. I have been learning on my own all this time and just testing different apps and such. 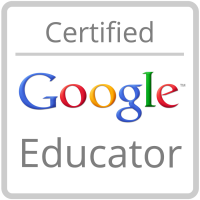 In May, I became a Google Certified Educator, and I hope to continue earning more certifications. Dream? Learn from the pros at Google. More recently, other teachers have asked me to help them learn the world of Google, and I have been happy to help. This summer, a colleague and I were lucky enough to run a 3-hour workshop to help teachers in our county get some basics of using Google Drive with the app Doctopus/Goobric for sharing and providing feedback on assignments. Check out this link for some “How to” Google Slides presentations. I’m working on some screencasting videos and other ways that Google can make your life in the classroom easier and more relevant to your students, so please be sure to check back soon!